The phenomenal growth of internet services over the last two decades is best seen through numbers. In 1995, less than 1% of the global population had internet connection but today, half of the world’s population is online. In the U.S, over 80% of the population is online according to the International Telecommunications Union (ITU). In essence, the internet has become a basic service touching on all aspects of life. From entertainment, health, personal and business communication, educational services, to news, everything is now happening online. Fast and affordable internet impacts a wide range of areas; businesses can offer better services, households can watch the best shows, researchers can do more, medical experts can offer real-time solutions, and everyone gets news fast. 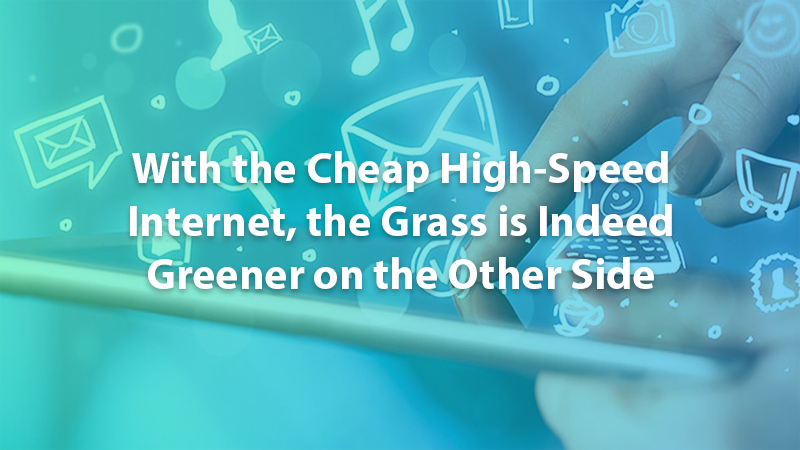 The problem is that cheap high-speed internet remains a mirage for many consumers. According to the latest Consumer technology Association (CTA) report, the U.S doesn’t rank in the top ten countries with the most affordable and fast internet in 2018. Well, you can still enjoy the affordable internet and this article examines ways to help you do exactly this. Keep reading. If you want to enjoy the cheaper internet, it is important to assess what kind of a user you are. Many people pay for internet speeds they don’t need and ISPs will never tell them so. The fact that most consumers buy internet services under pressure means they don’t get to evaluate what is in the package. Of course, every marketer will tell you that the highest bandwidth package is ideal for you even when you don’t need such speeds. For multiple devices in your home or office and data-intensive activities, you need higher speeds but for general web surfing, email and social media use, it is advisable to go for a lower speed package. Now, if you need HD video and it is possible to enjoy this at 5-8 Mbps, there is no need to go for a more expensive package for speeds of 50 Mbps and up. You might gloat about having the high-speed internet but ultimately, you will only be lining your ISP’s pockets with your hard earned cash. Now, one reason most people stick with slow, expensive internet service provider is due to lack of information. It is unfortunate that in this age of information, consumers still pay through the nose for internet when they can switch to alternative ISPs and enjoy better services. It is understandable that changing your ISP is a frightening prospect but you should look at the benefits you will enjoy. Better still, you don’t have to read through brochures and contracts because a quick ISP search using your Zip code is all you need. Reliable search platforms now allow you to find the best ISPs by zip code and you also get invaluable information about companies available in your home area. It is now possible to compare the top internet providers including Xfinity by Comcast, Optimum Online, Cable One, Spectrum, Qwest Centurylink, Frontier, Mediacom among others on search platforms such as Cable Papa. They say you get what you pay for and this aptly applies to internet services. Now, when searching for affordable internet services, you need to think beyond the price quote and instead look at the whole package. It makes no sense to switch from your current ISP to a cheaper one only to find their services are poor and there’s no customer support. In this age of digital gadgetry, there is no reason you should be paying a modem rental fee. It is simply a way of milking more money from you and yet you can buy your modem. When comparing ISPs in your area, look for companies that either offer a free modem or allow you to use your modem. A modem rental fee of $9 per month might look like a big deal but it only adds up to the total cost of internet. If you want to access cheaper internet services, it is time to do away with the modem rental. Internet service providers are eager to sell you bundled services and on the surface, it looks like you save a lot of money. The reality is that you might not make any savings if you already have TV and phone services. Most people today use mobile phones and they already have cable TV. Now if you buy a bundled package while you already have TV and a mobile phone, you won’t save any money. Some ISPs might try to spike the internet prices if you turn down the bundled package but you can use a comparison tool to find a cheaper option in your home area. With the increasing competition in TV and internet services, providers now offer enticing offers to attract new customers. Look for special promotions to enjoy a break on the prices in the market for some time. Consider whether a lock-in contract for the promotional price is worthwhile by comparing the market price movements over the last year. Make sure you read the fine print on these promotional offers and ask about the after-promotion price. Most ISPs also offer subsidies to low-income customers, families with children, seniors, and community college students, families participating in other government aid programs, families with at least one member enrolled in SNAP among other offers. You should ask available ISPs in your area if they have such subsidies and check whether you qualify. To enjoy high speed affordable internet, you have actively search for alternatives. Look at all aspects for the internet packages offered by ISPs in your area and always go for internet services that suit your needs.